Wedding DJ Hire Nottingham, Derby, Leicester, East Midlands. Wedding and event DJ Nottingham. Experienced wedding DJ to hire in Nottingham, Derby, and the East Midlands. Our wedding DJ uses beautiful state of the art equipment including video screens which can be used to display photos, personal videos or music videos. We offer experienced wedding and event DJ hire in Nottingham and the East Midlands. Jak has been a mobile DJ for almost fifteen years and has become extremely talented and experienced. We pride ourselves on our appearance and use only the best equipment available. Jak uses a lovely starlight DJ booth to work from. Not only are they the in fashion DJ item, they're also incredibly versatile and are available in both white or black. Whether you're having an intimate or large wedding, we tailor our wedding setups to suit your personal needs. 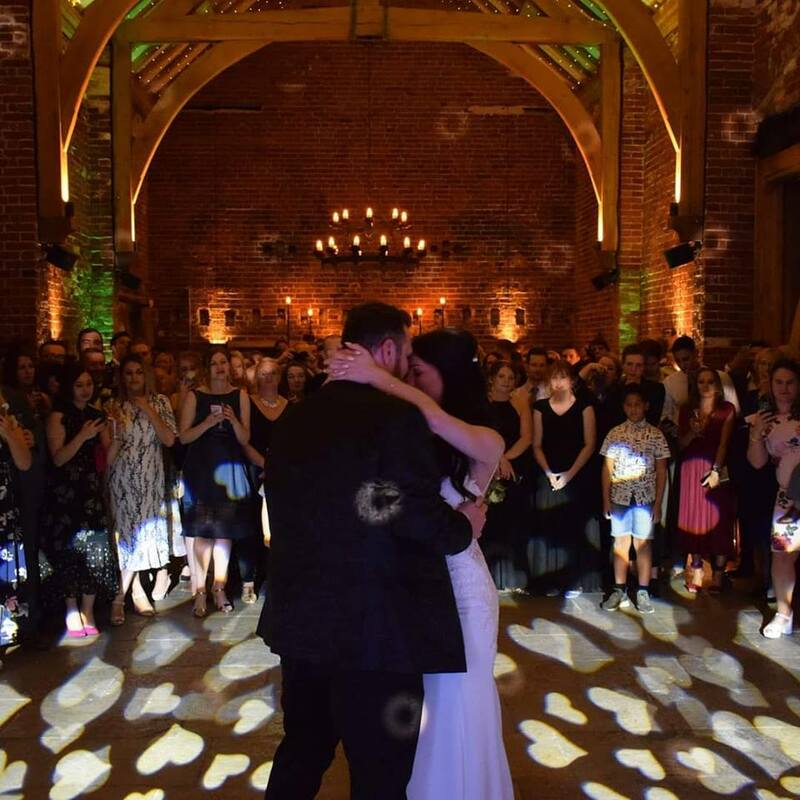 We provide a range of services including mirror balls, venue mood lighting, DJ lighting, personalised projectors, dancing on a cloud and more. All of our equipment is tested regularly and spare equipment is always carried with us, just in case. Choosing the right DJ is very important, after all, we will be providing the entertainment for your evening and we want your day to be perfect right up to the very end. We don't mind if you want the dance floor full all night or a more relaxing atmosphere; we guarantee to listen to your needs. With years of experience to call upon, we know that no two weddings are the same. For that reason, we do not use a set playlist of music, instead we read the audience on the night. Anybody can make requests. Once you have booked with us you will be provided with a wedding planning form to inform us of any special requests for your big day. Our brand-new dancing on a cloud experience uses dry ice to create the effect of clouds at your feet during the first dance. This can be used to create a magical touch and makes for beautiful first dance photos!